'Tin Mitin' there are three detective stories in this collection these are- Bish, Trishna Mara Gechhe, Maran Batas. 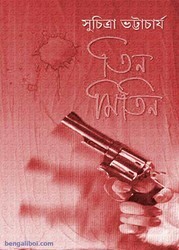 The book written by eminent Bengali penman Suchitra Bhattacharya. She is the author of the female detective character Mitin Masi in Bengali literature. And in this series she wrote many teenage detective novels. Today I brought to you an ebook- Tin Mitin, there are many PDFs of this book all around the internet but the quality of all is very bad and double pages so friends, now I want to share high quality pdf file in this post. The pdf has 126 pages, 8mb file size.